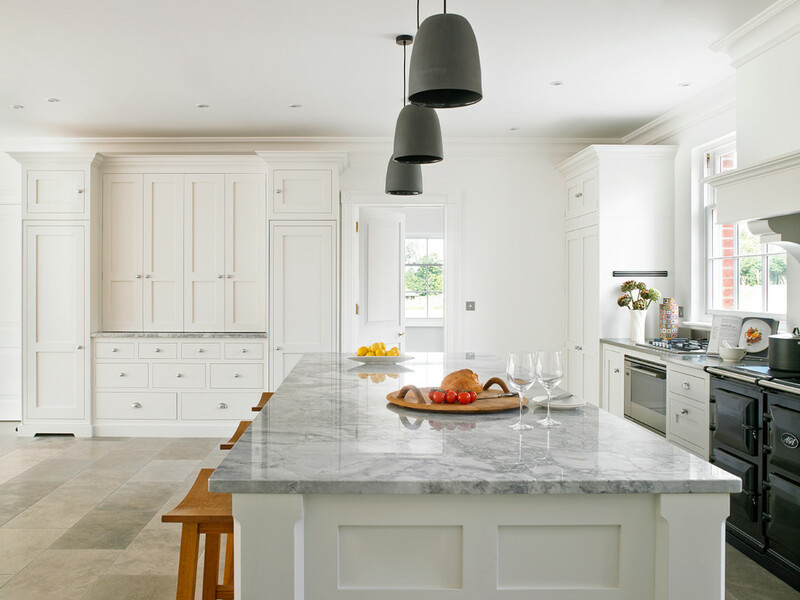 What are the Differences between Quartzite and Marble Worktops? Renovating your kitchen and wondering whether to go for the classic marble worktop or its popular look-alike option, the increasingly fashionable quartzite? 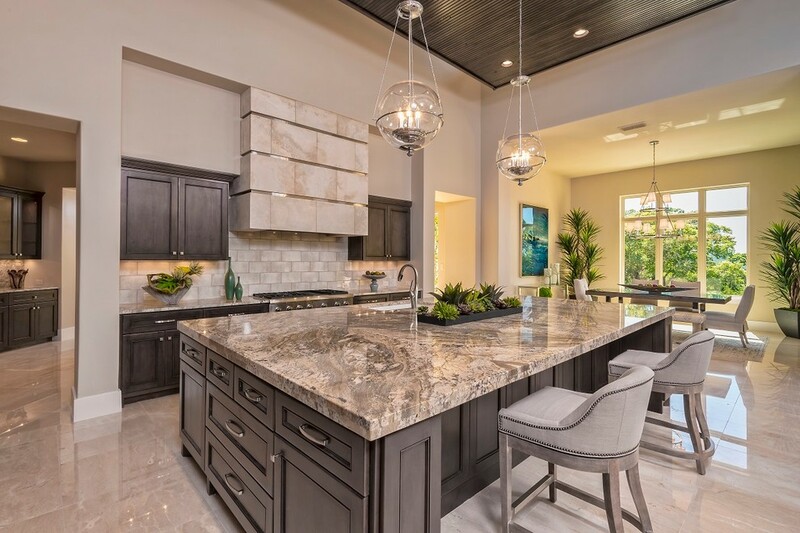 Apparently, both are high-end, stunningly beautiful natural stones that can add a touch of elegance to any kitchen décor, whether it is for a contemporary or traditional design. Quartzite also works great with period properties as it adds a mesmerizing sheen on a distinctive stone surface that contrast incredibly well in environments that display ancient tones and accents. But this only adds to your dilemma, right? The best way to narrow down your search and figure out which stone will work for you is to learn about their key differences. Marble and quartzite are both non-foliated metamorphic rocks and quite similar in appearance. Marble tends to be more prevalent in white and creams (although there are grey, black, brown and many other shades of natural marble too). Quartzite also comes in many shades of white, grey and cream but there are also many bold coloured quartzites such as the vivacious Moulin Rouge or the exotic Azul Macaubas which displays a beautiful array of sky blue veins in wide variety of tones. Both marble and quartzite have some unique characteristics and distinct qualities. Let’s delve a little deeper to help distinguish between the two natural stones. Limestone naturally turns into marble when it is exposed to intense heat and pressure over very long periods of time. Marble owes its classic beauty and pure white colour to the presence of re-crystallized carbonate minerals such as calcite and dolomite. 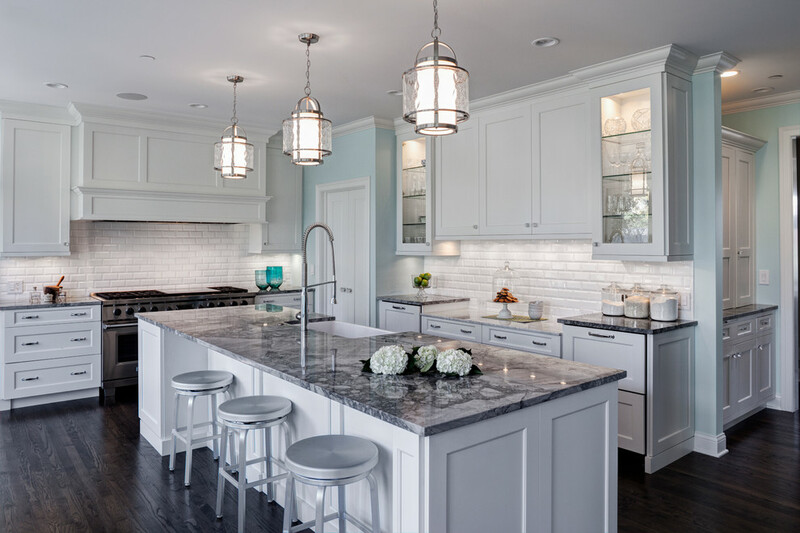 The most popular marbles such as Carrara, Calacatta and Statuario have grey veining on different shades of white backdrop, respective to each of these materials. There is also a lot of Grey marble such as Grigio Carnico, Bardiglio marble, black marble (such as Nero Marquina from Spain), Brown (Emperador) and almost any other colour in the palette you can think of. Marble tends to offer an overall elegant yet subtle look most of the time. Quartzite is formed when sandstone is subjected to heat and pressure within the earth’s crust which is a process which is more similar to the formation of granite. The resulting stone is smooth in terms of finishes and with a wonderful array of tones, interesting streaks, striking colours and lovely patterns which allow creating original designs and displaying exotic materials with unique features. 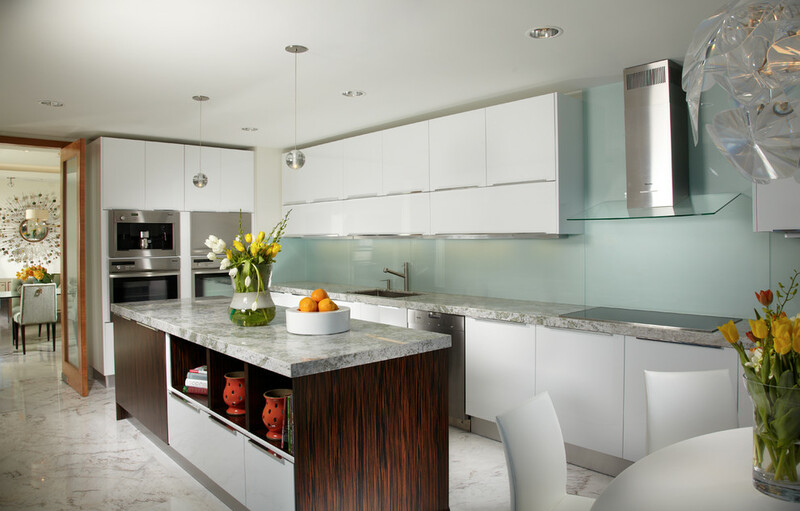 Marble is generally associated with a white, smooth, mirror-like finish. This flawless beauty of marble is attributed to the presence of calcite and dolomite crystals. However, penetration of impurities in the composition such as iron oxides, mica, carbonaceous minerals or silicate can lead to veining and hues like amber, green rose and grey to name a few. Photo by Granite Division Inc.
Quartzite in its purest form can mimic and match the striking porcelain look of white marble. However, quartzite is not just limited to shades of white or creams. The popular stone is available an array of colours like brown, pink, green, purple with gorgeous patterns. In a bid to thwart, staining, moisture, and etching, sealing is recommended for both quartzite and marble worktops. While the former requires a protective sealer twice a year, the latter being softer and more porous than quartzite needs to be resealed approximately every 12-18 months, depending on how much use the surfaces receive, to keep it looking great. 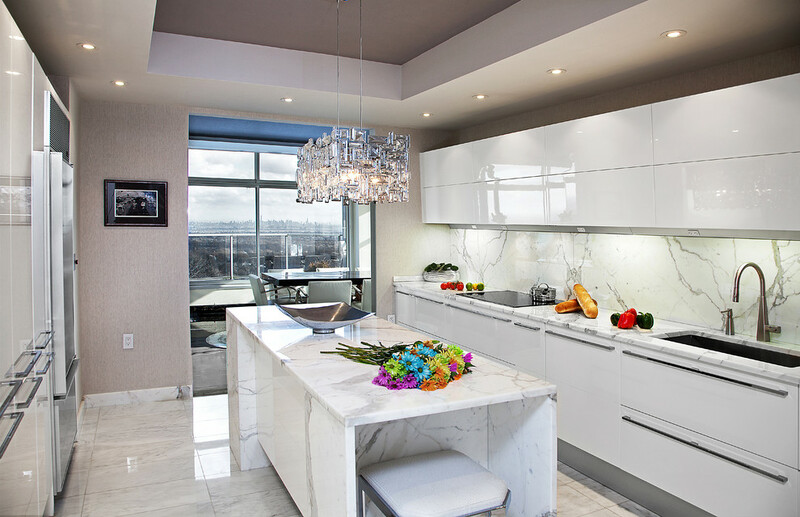 Marble is composed to a great extent by calcium which makes it more porous and slightly less durable than quartzite. It tends to absorb liquids to a greater extent. It is also more prone to chipping, scratching and staining hence chosen by sculptors for carving. Having said this, marble remains one of the strongest materials in construction and both buildings and statues have lasted for centuries when made in this material. 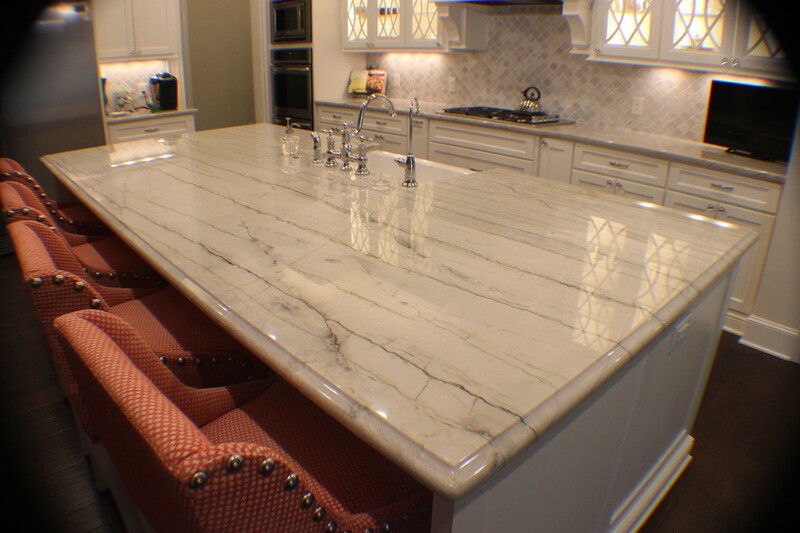 In contrast, a quartzite worktop is much sturdier and tougher than its marble counterpart. Some quartzites are stronger than the toughest granites and very difficult to get scratched. Quartzite also has a higher density which makes it less susceptible to staining as well the routine wear and tear of the kitchen grind. Marble is softer than quartzite and fairly porous. Acidic foods such as lime juice, ketchup, wine or vinegar may cause etching (discolouration and dullness) on the surface. Quartzite, on the other hand, is more resistant to acid as the absence of the carbonate minerals like calcite within it, resulting in a natural stone that doesn’t etch or discolour. Photo by A-Design By Gustavo Arredondo, Inc.
We hope the above information has provided you with some clarity on the differences between these two natural stones. If still unsure, consult an expert fabricator or an experienced natural stone supplier who can enlighten you further on the two materials in terms of affordability, maintenance and more to help you make an informed decision for choosing the right type of materials to be used for your kitchen worktop.